BID could not function without the support and commitment of its volunteers. We provide training and hands-on experience, under the supervision of an experienced legal adviser and in return ask for relevant qualifications, experience and a regular time commitment. Travel expenses are reimbursed to a maximum of £10 per day. 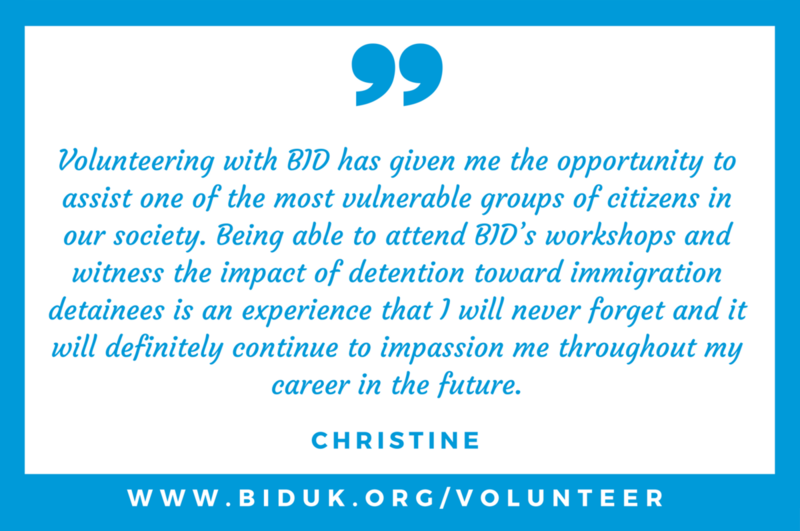 For more general information about volunteering at BID please read the information pack which can be downloaded towards the bottom of this page. We recruit for casework volunteers on an ongoing basis. Placements are subject to availability and demand is high. We prioritise those with the most relevant experience and who can offer the most time commitment. 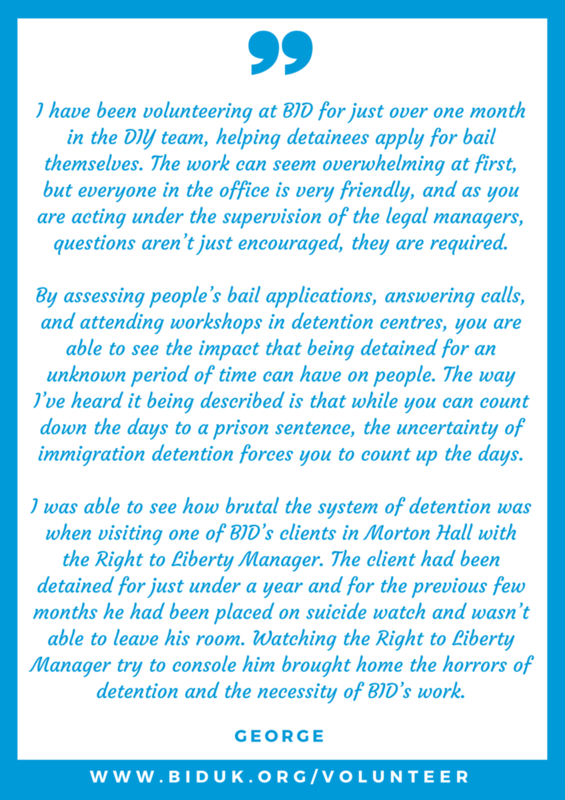 In turn, volunteers receive training in asylum, immigration, human rights law, bail and detention to enable them to take exams to qualify as Level 1 caseworkers with the Office of the Immigration Services Commissioner. Please complete the application form, which can be downloaded at the bottom of this page, and return it to the address noted on the form. Research & policy volunteers are taken on at irregular intervals and are usually recruited separately for particular projects. You can download our job description for research & policy volunteers from the bottom of this webpage. Please send your CV to [email protected] if you wish to be considered for any research & policy volunteering opportunities which may arise.